The crust is of two different types. One is the continental crust (under the land) and the other is oceanic crust (under the ocean). The continental crust is thicker, and the oceanic crust is thinner. The thickness of the crust varies from 5 to 70 kilometers. The temperature of the crust increases with depth because of geothermal energy. Where the crust meets the mantle the temperatures can be between 200 °C (392 °F) to 400 °C (752 °F). The crust is the coldest layer upon all the layers because it is exposed to the atmosphere. Earth's mantle and crust formed about 100 million years after the formation of the planet, about 4.6 billion years ago. At first the crust was very thin, and was probably changed often as the tectonic plates shifted around a lot more than they do now. The crust would have been destroyed many times by asteroids hitting Earth, which were much more common in the Late Heavy Bombardment. The oldest oceanic basalt crust today is only about 200 million years. 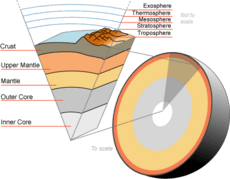 Most of the continental crust is much older. The oldest continental crustal rocks on Earth are cratons between 3.7 to 4.28 billion years old. These have been found in the Narryer Gneiss Terrane in Western Australia, in the Acasta Gneiss in the Northwest Territories on the Canadian Shield, and on the Fennoscandian Shield. A few zircons at least 4.3 billion years old have been found in the Narryer Gneiss Terrane. The average age of Earth's continental crust is estimated to be about 2.0 billion years. Most crustal rocks formed before 2.5 billion years ago are in cratons. Such old continental crust and the mantle below it are less dense than other places in the earth. These are not easily destroyed when the plates shift. The making of new continental crust is linked to times of major orogeny or mountain building. This happens at the same time as the formation of the supercontinents such as Rodinia, Pangaea and Gondwana. The crust forms in part by the coming together of island arcs including granite and metamorphic fold belts. They are kept together partly by the using up of the mantle below the crust, which makes a mantle on which the crust can float. Earth's crust Facts for Kids. Kiddle Encyclopedia.